For my first staple meal I just had to post Black Bean and Rice Burgers. I almost always have these ingredients on hand and, hey, what’s more vegetarian than a fake hamburger? 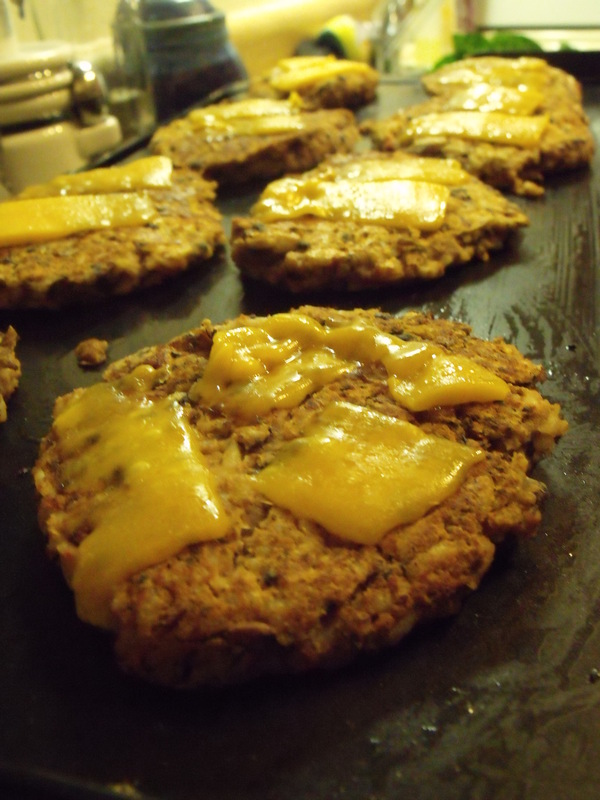 🙂 Really though, all laughter aside, these “burgers” taste amazing – my omnivore husband even loves them! Add a salad and some oven fries and you’ve got a delicious (and inexpensive) meal on your hands. In a large bowl, mash beans with a fork. Add the rice, egg and 2 tablespoons salsa; mix well. Drop by 1/2 cupfuls into a large nonstick skillet coated with nonstick cooking spray or olive oil. Flatten to 1/2-in. thickness. Cook over medium heat for 4-5 minutes on each side or until firm and browned. In a small bowl, combine sour cream and remaining salsa. Place a lettuce leaf, burger, sour cream mixture and slice of cheese on bun. -To give them a better flavor, I also add any or all of the following: garlic powder, onion powder, salt, pepper, taco seasoning, chili powder, cayenne pepper, and/or cumin. -To make a larger quantity of these at once, I’ve taken to cooking them on my electric griddle. -The salsa and sour cream mixture is quite tasty, but we have eaten them without it many of times or substituted with something else.